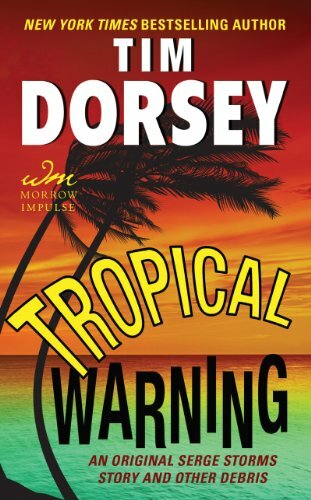 Today’s Guest: Novelist Tim Dorsey, author of Hurricane Punch. Order ‘Hurricane Punch’ by Tim Dorsey, available from Amazon.com in print or ebook by clicking on the book cover above! The first time I tried my hand at fiction in high school, it was a way of dealing with people and issues that I couldn’t handle in real life. My friends thought it was hysterical and that I was a little twisted. In college, I again used fiction writing for my personal aims, this time to deal with my frustrating inability to get laid as a freshman at the University of Miami. I thought it might be a way of leveling the playing field. It didn’t change my virginal status, but as the manuscript was handed around the dormitory, I earned a different kind of reputation. I was the guy who remembered and chronicled all the stuff that happened when everyone else was falling-down drunk, and I was the guy who, if you messed with me, would get even with you at the typewriter. And isn’t that what the power of the press is all about? Twenty-five years later, I read the latest novel by Florida writer Tim Dorsey. Hurricane Punch reminded me of, well, me. As I turned the pages and read about people being barbecued by military meals-ready-to-eat lasagna or being fried by the world’s most powerful guitar amp, I remembered the thrill of brutalizing the people I thought were idiots or who had done me wrong. Dorsey, who’s joining us today (April 12, 2007), is a former journalist who made it out alive, having worked at the Tampa Tribune from 1987 until 1999. 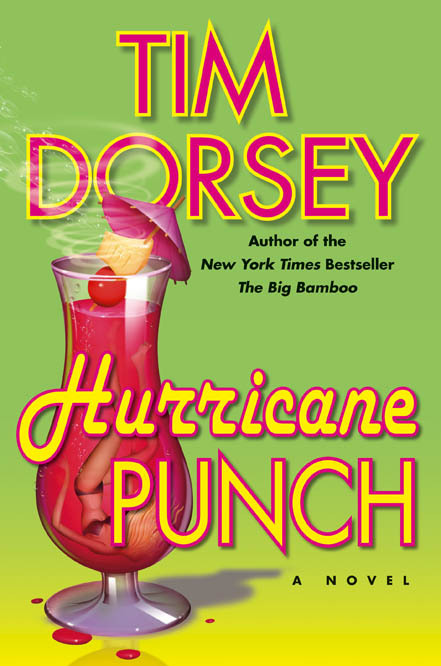 Hurricane Punch, which was published in February 2007, is Dorsey’s ninth novel. It’s an all-too-funny story about life in the world’s emerging media capital, Tampa Bay, during hurricane season. It skewers the media left and right, which made it perfect for discussion here. BOB ANDELMAN/Mr. MEDIA: Not to make your interview all about me, Tim, but am I the only one who thinks fiction writing is a great place for vengeance? TIM DORSEY: Umm, actually, I think maybe that’s the chord that I struck. It’s a lot broader than I think even my publisher or my agent thought. Originally, I guess it was presumed that these would be more of a cult or underground type thing, but just if you look at my Web site, the pictures of my audiences, they look the local neighborhood association. Well, I have a theory about that, and that is that even more so than your background and mine, I think out there there is this kind of untapped reservoir of this feeling that all the people that obey the rules and are good pillars of the community, there is a growing resentment that the people who are breaking the rules are winning. Maybe vicariously, through Serge and the books, they see these miscreants who are getting their just desserts. ANDELMAN: I was kind of reminded of the Zach Braff character on “Scrubs” who is dealing with real life, and you always see what’s actually going on in his head and what he’d like to do and how he’d like to deal with the person. And that’s pretty much what Serge does. I mean, he just deals with it the way he wants to. He doesn’t seem to filter things like the rest of us do. ANDELMAN: Oh, absolutely. Well, I was going to ask you, I mean, it seems like there is a little passive-aggressive streak at work with the author here? Order ‘Tropical Warning: An Original Serge Storms Story and Other Debris’ by Tim Dorsey, available from Amazon.com in print or ebook by clicking on the book cover above! maybe there was a lot of bottled-up frustration that ended up coming out as Serge’s violent streak. And then as my dreams came true and I got books published and sales started going up and royalties started going up, I became quite happy. People started complaining that Serge wasn’t killing enough people, and they were criticizing the books, so they pissed me off, and I killed more people. ANDELMAN: A lot of what happens happens on the road in different places, and I got to wondering. I saw that you have done well over 800 personal appearances for the books over the years. Do you find yourself hatching up ways to kill people while you’re out traveling? DORSEY: Yes. Actually, when I speak to writers’ groups, I explain that most of my best writing is — and I don’t mean to be glib here — but it’s done like in the shower or while driving. What I mean by that is, I don’t sit down at the computer and think of what I’m going to write. I already pretty much know what I’m going to write by the time I sit down, because I’ve kind of daydreamed it and turned it over and visualized it in my head while doing other stuff. ANDELMAN: Did you ever think that Serge was going to become, I don’t know if alter ego, because, you know, hopefully you’re not quite like that, but did you think that you’d be living with him 10 years later? 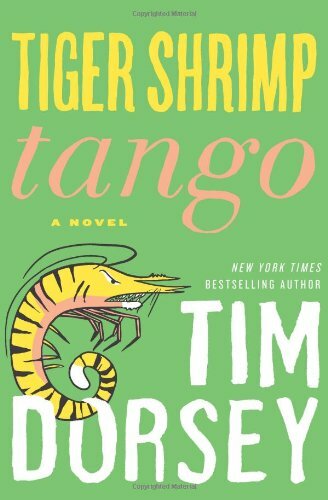 Order ‘Tiger Shrimp Tango: A Novel’ (Serge Storms) by Tim Dorsey, available from Amazon.com in print or ebook by clicking on the book cover above! DORSEY: You know, I guess it’s like young people. They don’t look for the future. You know, if you’re 18 or you’re 21, you never think of being 25. It’s like when I started, I just wanted to get one book published and just be able to hold a hardcover with my name on it in my hand, and that would have just been, you know, like winning the lottery, and I really didn’t think beyond that. But it just took off, and I ended up connecting on levels that my publisher and I didn’t necessarily expect. ANDELMAN: You and I have never met or officially crossed paths, but I was actually at the Tampa Tribune in l986. DORSEY: I came in 1987. ANDELMAN: Right, and it wasn’t hard for me to imagine a couple of things while reading Hurricane Punch. One is, I guess by the time you were writing the book, you were a copy editor by then. You were no longer out working a beat. But I know that room that you were in, and I know what had been going on in the years leading up to that. I mean, you make reference in the novel a lot to “convergence,” and I can just imagine a copy editor sitting around daydreaming about other things. Am I wrong this was going on? DORSEY: Doing anything but the work I was paid to do (laughs). DORSEY: Actually, it’s interesting. As I was working on the very first book, which was Florida Roadkill, I wasn’t going to have violence or crime or anything in the books, I was just going to have satires on Florida because I felt that would be a crutch, but it’s been a great crutch. I finally had an epiphany that basically the crime and all of the news stories I’ve covered either as a reporter or an editor, it’s what I know, and I had a large tank of material to tap into. Literally the day the first book got published is when I left the Tribune, but while I was working on that first book, I was writing it at home, but as you know, when you write something, it’s constantly, even though you have an outline, it changes as you go along. Each shift at the paper, whatever my imagination might have thought up, quite often reality would trump it. Something would come over the AP wire, or the cop reporter would come over and tell me something, an arrest report he just picked up, and I would slide open my drawer and get my note pad and make a note for the next chapter. ANDELMAN: So you didn’t actually write this at work? I’m very disappointed to hear that. ANDELMAN: No, I mean Florida Roadkill. I was really hoping to hear that you wrote it in between stories at the Tribune. DORSEY: Oh, no, no. Actually, I really didn’t. I would take shorthand notes if I saw a news story come across that I thought I could use, but no, I did this… And I worked the night desk, so I would think about it at work, but I would come home and write late into the night after the night shift or get up early. It was one of those sorts of med student residency crucibles that you have to survive, pulling a double shift like that, but…. Nobody has time to write a book. You just have to do it while juggling the other job. ANDELMAN: You used up an awful lot of pop culture and Florida news references in this book. I was amazed. It seemed like every time I turned a page, it was like, oh, right, there’s Terry Sciavo… Did you use too many? Did you really have enough for the next book? DORSEY: I’ll tell you, I have a stack of newspapers right next to me here in my office, and it’s like a conveyor belt. You never use it up. Remember the Lucille Ball episode with the cream pies coming down? You’re never going to run out of weird news stories in Florida. There will always be… You can’t get enough books out, frankly. 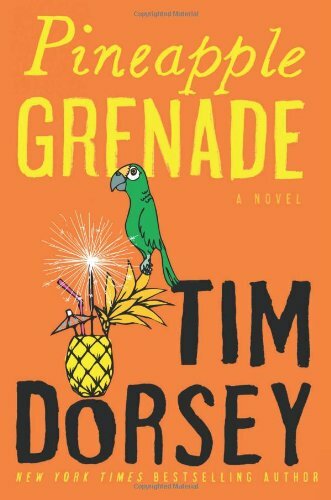 Order ‘Pineapple Grenade: A Novel’ by Tim Dorsey, available from Amazon.com in print or ebook by clicking on the book cover above! DORSEY:Well, I think first as far as the genre, and this goes to another question that people ask as far as what is it with the journalists so heavily populating that school of writing? The question answers itself there that the ones who read the news, especially the little stuff on the wires that doesn’t necessarily make the paper, all those little tidbits, that’s responsible for the genre of basically the journalists. And then the other part as far as why it’s so odd, I just think it’s a combination of the weather and the lack of control of the state. There is a robust business in the economy, but nobody’s really running things in the overall sense. Everything is up for grabs, and there is such growth and transiency of population that people just pass each other. It’s very easy for somebody who’s on the lam or doing no good to sort of blend in or hide in the cracks. ANDELMAN: One of the great themes in the book, of course, is media convergence, the idea that McSwirley has an unused video camera in his bag at one point comes into play. I wonder if you could spell “convergence” for me and use it in a sentence appropriate to the book. DORSEY: Now I am trying to think of a joke here. It’s basically, convergence. I’m sorry, can we edit this out? I can’t think of a glib line there. ANDELMAN: You want to skip the spelling part, the “Are You as Smart as a Fifth-Grader” part of the interview? DORSEY: I was just about one synapse away from a joke, and I couldn’t make it in real time there, so…. ANDELMAN: Is convergence a bad thing do you think as you think about it and you look on it? DORSEY: Not in concept, but it can be in execution. I mean, in concept, it can be great. Now we’re playing “Inside Baseball” with a lot of people who aren’t…. ANDELMAN: Well, you can only respond to the questions that are thrown at you. ANDELMAN: Hurricanes, of course, play a very big part in the book, and for people who haven’t read it yet, the title is Hurricane Punch, and obviously there’s a tropical drink on the cover of the hard cover, but the book is really about a guy who loves the thrill of the hurricanes and also the media coverage of hurricanes. Do you have any good personal hurricane stories? Have you been evacuated, for example? Order ‘Shark Skin Suite’ by Tim Dorsey, available from Amazon.com by clicking on the book cover above! DORSEY: Absolutely, and as a matter of fact, that’s how the book came about. I was getting to ready to write that book, and I was working on the outline of a book that had certain elements but non-hurricane elements of it, and that was in the 2004 season. Little did I know that 2005 was just around the corner, but what happened was, as I was starting to write the book, I couldn’t get it on track because we were, literally, constantly either evacuating…. We have relatives in Vero Beach, and either they were evacuating over here, or we were evacuating over there like constantly. Constantly getting supplies, putting down shutters, putting up shutters, zipping across the state, taking in relatives. It became a routine lifestyle. And then during that, I’m a news junkie, so I always have CNN or MSNBC or something on. During that whole period, I was also bombarded with just the surrealness of reporters covering hurricanes. Either they are standing out where nothing is happening trying to make it exciting, or they’re brainlessly standing where they should never be. Anyway, it was just how my life was during the writing of that book, which, by the way, we were extremely lucky. I mean, my family dodged a lot of bullets. My in-laws from Vero Beach got clobbered a couple of times. They lost electricity for weeks, the roof, etc., etc. Over here, we did exceptionally well. ANDELMAN: It is, and frankly, being still in the media, I don’t know how they would do it any differently, because you’ve got to go and plant yourself at a place and think you’re either going to get great footage or nothing’s going to happen, but you’re still there, and you have to report, and you captured that so well. It was one of the things I really loved about the book is that it’s inane, but it’s necessary. DORSEY: What killed me is, I think it was in the 2005 season where Key West, I guess Key West got brushed. I mean, they had massive damage from the storm surge from a storm that really didn’t hit them wind-wise, but as it went by, the surge backwashed on them, and they really got hurt. But during a lot of the footage of that and the couple of storms that brushed them… And you know, iIf you know Key West, you could predict this, is there would be a reporter out there on live TV, and they’d be just like people walking behind them with drinks, and they’re out in a monsoon, and it’s just a scream. ANDELMAN: To change the subject just slightly, I mentioned that you have done something like 800 personal appearances, and you’ve obviously gotten very good at it. If people go to timdorsey.com, they can see that you have hats and t-shirts for Serge and for the books. It’s become a whole little cottage industry. Do you like the appearances, and how do you make them work so well for you? DORSEY: It’s interesting. At first, you have to try to sell your name and all that, and now it’s just like meeting with a bunch of friends each place I go. We just get together and have fun. And you know how it is when you have your certain group of friends, and basically the people you end up friends with are the ones with similar senses of humor. I mean, after just spending enough time each time you get together with some friends, you just start cracking up over stuff. And with these books, it kind of brings out people of like minds when it comes to humor, and so we just get together. I have discussions, and we end up cracking each other up, and they give me a lot of great material. We had a good time this last tour with a lot of the current news that was going on. But if anything, the readers make it work, because they are already pulling for me, and they want to talk about Old Florida and Serge, of course, and the people that they love that he’s bumped off. ANDELMAN: Do you remember the first time someone showed up with the “S” tattoo? Order ‘Triggerfish Twist’ (Serge Storms) by Tim Dorsey, available in print or ebook from Amazon.com by clicking on the book cover above! ]DORSEY: Yeah, a couple of people have been Serge tattooed, and they’ve emailed me their photos. The one I specifically remember was at a book signing where I didn’t see the person until the person in front of them had their book signed, and then the next person stepped up in line. And if you know the books, you know that… It was a guy, and he was dressed in a blue NASA astronaut jumpsuit, and he was carrying a silver briefcase. Of course, you know, that’s Serge. That was great, and then I had in southern Palm Beach County at a Barnes and Noble just on this last tour, I had two women show up. One was “Sharon,” the stripper from Florida Roadkill, and the other was “Molly,” the love interest in Torpedo Juice. DORSEY: Yeah. They showed up, and one had like a bag of white powder. It was just crazy. ANDELMAN: Have you optioned any of these yet? DORSEY: Yeah. We currently have an option. We have optioned Florida Roadkill, which essentially means that they have dibs on the series because the way it works is if you have a character throughout the books, they are entitled to any of these other books if they want to use material. ANDELMAN: Is there any activity on the option? DORSEY: You know, I have no idea. This is the third time we’ve optioned it, and you can option it a million times, and they don’t make it, or just out of the blue, one day you hear they’re about to go into production. I’m so busy with the books I don’t check with them. I guess they’re glad, because I don’t know how other authors are, but I’m sure they don’t want to be bothered by the guy who wrote the thing, they just want to…. ANDELMAN: In reading, it would seem that it would make a great series like on Showtime or HBO where they could deal with the themes. Obviously, I am sure you would be thrilled to have a movie made, but the material would really lend itself to an adult-type of ongoing program, I would think. DORSEY: Well, I wouldn’t argue with anything they would like to do. ANDELMAN: I got you. I understand that the paperback edition of Big Bamboo is due out any day, or is it out? DORSEY: It literally just came out, so you’re correct. ANDELMAN: All right, so we’re right on top of that. And you’ve finished the next book, number 10? ANDELMAN: Does it have a title? DORSEY: No, not in stone. I have a couple of things I am playing with, but as in the past, if I cast something aside, I might use it two or three books down the road, so no, we don’t have a finalized title, yet. This is “Untitled Book Number 11” is how we’re talking about it. ANDELMAN: Oh, is that one number 11? ANDELMAN: Oh, okay, I guess I got my count wrong. So Hurricane Punch was number 10? DORSEY: I apologize. Literally, on the computer screen in front of me is number eleven. DORSEY: That’s number 10. Number ten’s done, and I’m working on number 11. ANDELMAN: Okay. So my count is right. DORSEY: See, this is, yes, you are correct. That’s what happens when you get…. because literally because of the long lead time, you’ve got pretty much three going on constantly. One year you’re either wrapping up or touring for, one’s being edited, and the next one you’re writing. ANDELMAN: It’s a good thing to know what you’re doing next. Now, is there anything you can tell us about number 10, including when it will be out but also what direction Serge….? DORSEY: It’ll be out next January. There are a lot of other parts of Florida, but it takes place quite a bit in the Tampa Bay area. Serge and Coleman are back, for those who follow the series. 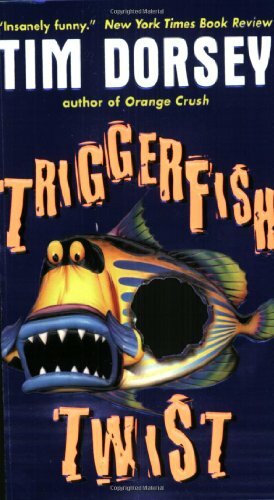 And you don’t have to know any previous books, each one should stand alone, but if anybody has read Triggerfish Twist, which was another Tampa Bay book, it picks up with a lot of those characters, reunites them, because I enjoyed that storyline and those characters. ANDELMAN: I know that was always the great thing I loved about the John D. MacDonald books years ago which took place in Florida that even though the character in the one series was recurring, you could pick up any book and get into it and know what was going on, and I think you’re right. It’s the same thing with these books. Any other hint of what’s going to happen that you want to tease a little bit? Is there an Evelyn Wood version? DORSEY: Let me think here. For those who are familiar with the series, Coleman will finally meet Lenny, and Johnny Vegas, the accidental virgin, is back by popular demand. It’s funny, because I go on the book tour, and I almost feel like an oldies rock act. They will call out requests for the next book, which character they want, some of the supporting cast they want back, so those guys are back. The E Team is back, the older women, the Davenports are back, so are the DS brothers, who are running the cheesy Hammerhead Ranch Motel over in Pinellas. ANDELMAN: Now what about my new favorite, Mr. McSwirley? Is it too soon to bring him back. DORSEY: I don’t want to give anything away, but I need a character, and I’m not sure… Either I am going to make a new character, or I am going to bring back one of several, and he’s in the running, but he might be a dark horse at this point.